There are a couple of common routes up to Manning Camp. You can do it one of the “hard” ways, The Douglas Spring Route (13 miles), Quilter Trail Route (14.5 miles), or Miller Canyon Route(9.7 miles); Or you can do it the harder way The Tanque Verde Ridge Route(16 miles). It is not the length alone that makes it more difficult but rather the constant elevation gain and then sacrifice all the way to Cow Head Saddle. This Route is described from top to bottom because that is the only way I have ever done it. I have done this twice while in High School and twice in the last 20 years and it hasn’t changed, it’s a rough long hike. Maybe it’s because when I do it I usually am toting a 40 pound pack. At Manning Camp the trail starts along the Cow Head Saddle/West Fire Loop Trail and heads north toward Helen’s dome. 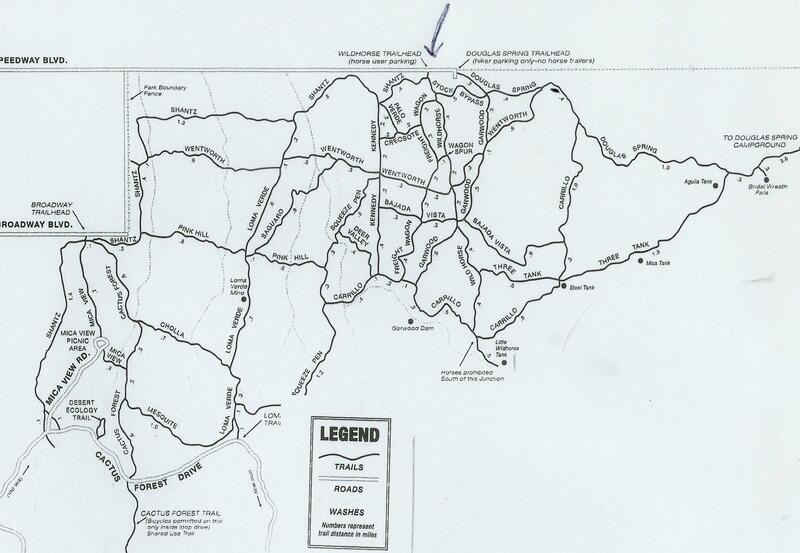 The trail has a gradual uphill slope to the North Fire Loop Trail and the North Slope Trail. 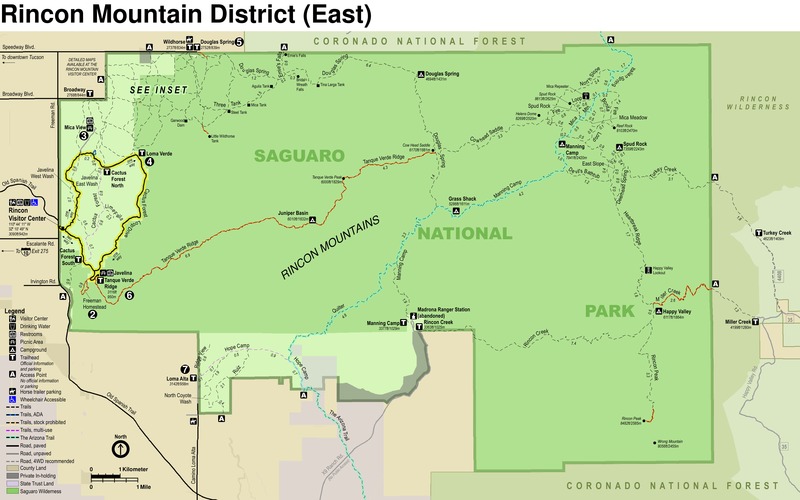 In the morning hours there are great views to the west of Tanque Verde Peak, south toward Santa Rita Mountains and the Southeast side of Helen’s Dome. From here the trail heads down to Cow Head Saddle, about 3.6 miles. For the first 2 miles it follows along one of the creeks that will eventually drain into Canyon Del Pino and eventually Tanque Verde Creek. This is a rather pleasant portion of the trail that travels through a Ponderosa Pine forest that has seemed to escape the numerous fires that have plagued the Rincon Mountains. The creek exits off to the right and the trail without climbing becomes a ridge trail, following the ridge on down to Cow Head Saddle. At Cow Head Saddle the trail intersects the Douglas Spring Trail. 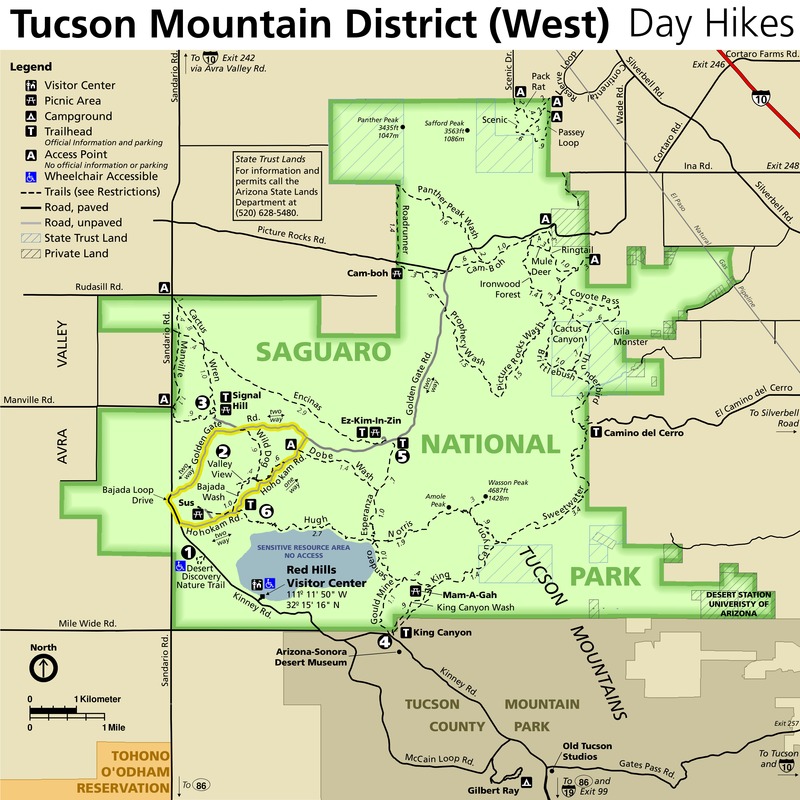 If you haven’t already made up your mind you have three choices; Right to Douglas Spring and the Speedway exit (8.8 miles), left to the Quilter Trail and Camino Loma Alta exit (10.6 miles) or straight ahead along the Tanque Verde Ridge Trail (11.7 miles). Since this description is about the Tanque Verde Ridge route, there is only one logical way to go. 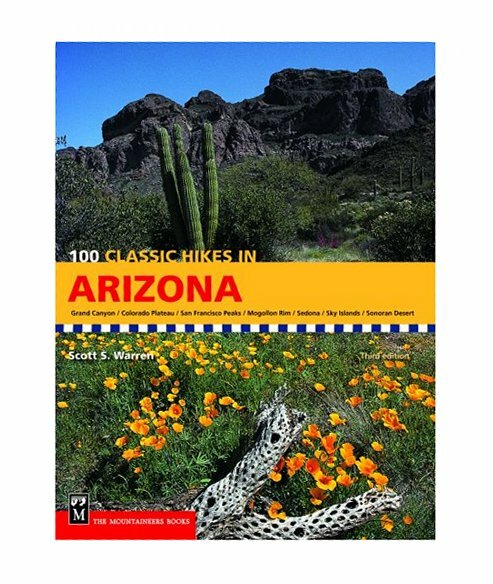 The trail starts out from the saddle with an immediate climb to Tanque Verde Peak, 900 feet and 2.5 miles. From this portion of the trail there are good unobstructed views in almost all directions, particularly east of the ridge you just hiked down from Manning camp. When you reach the trail summit spend the little extra effort to go the .1 miles to Tanque Verde Peak, great views in all directions. The trail from Tanque Verde Peak almost immediately leaves the Ridge and heads in a southwest direction down to Juniper Basin (1.7 miles). This portion is a little steep in places as it heads down the Rocky south slopes of Tanque Verde Ridge and levels off a bit as you approach Juniper Basin and Campground. I have usually found water in the creek in Juniper Basin. This creek ends up in Box canyon below Juniper Basin and eventually into Rincon Creek/Pantano wash. I have never seen anyone camping at Juniper Basin. The trail continues west along Juniper basin and stays fairly level back onto Tanque Verde Ridge while the creek exits to the southwest. From here the trail follows the ridge down for six miles in what I always thought was a long monotonous trek. The trail for the first half follows the crest of the ridge and goes up then down every little peak (the largest being 100 foot elevation gain), does this six times before finally getting down to the business of dropping down to the trail head at the picnic ground in Saguaro National Park. The trail is in good condition the whole length and not overly steep in any areas, well maybe a short couple hundred yards coming down Tanque Verde Peak. There usually is water at Juniper basin into May (depending on year), summer and fall depends on the monsoon and fall weather. To avoid having my ride having to pay the Park entrance Fee to pick me up, I headed west to the Cactus Forest Trail entrance on Old Spanish Trail (I now have an old Geezer pass that only I can use instead of the yearly pass that allows one other person to use). 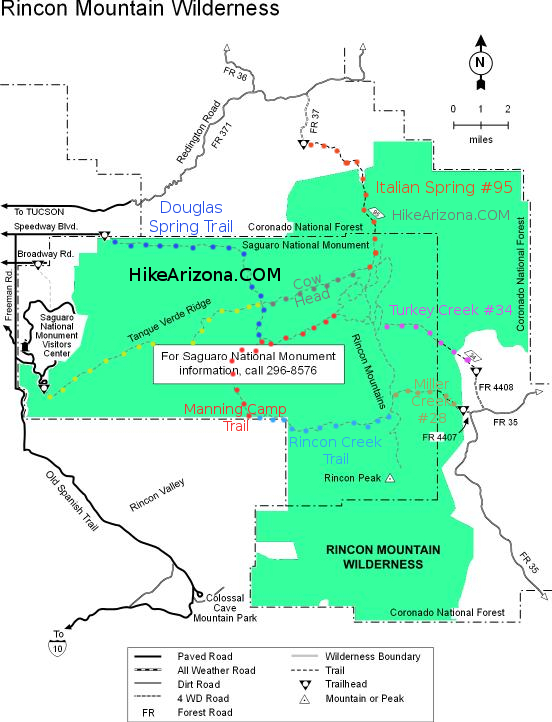 This hike while long seems to be a tradition for me so I continue to do it but the Douglas Spring is Shorter and if you don’t mind the drive to Happy Valley the Miller Trail is even shorter. 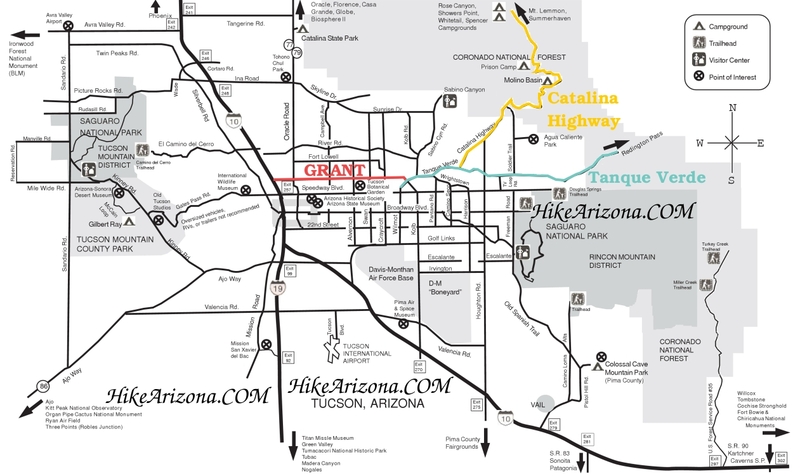 From Tucson, get to Old Spanish Trail (name of the road) and follow it south to the entrance of Saguaro National Park - East. Take the loop road south (turn right) and turn left into the Javelina Picnic Area. The Trailead is near the entrance of Javelina.